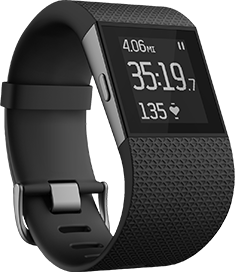 Everyone might be talking about the Apple Watch, but if you want to get your favorite college student the smartwatch they’ll really get the most out of, check out the Surge from FitBit. Available online and at retail stores. The monochrome touchscreen display is easy to read in sunshine and it lights up blue to make it even easier to read. This fitness superwatch tracks everything from steps, distance, calories, flights climbed, sleep, and active minutes, as well as continuous heart rate monitoring. It has built-in GPS tracking and also displays caller ID, app notifications, and music player controls on its LCD screen. You can also track your progress while biking, golfing or training for a marathon. Surge is sweat resistant and water resistant to 50 meters.